What We Are Given, What Is Left Behind. This has been on my mind for about three or so weeks, about what people give to us. Not physical objects like gifts or presents on our birthday but the taste in things we like. I think of it whenever one of these things stir my memory. Like when I am searching the music on my iTunes library I’m reminded of who these bands came from, which person from my past or present told me “Hey, you should listen to this. I think you would like it.” There are even some bands that I didn’t like when I was knew the person, but who I like now or they double up where one person got me to casually listen to a band but another person got me really into it. For awhile I just thought of this in terms of music but the same can be said for television, movies, and books. One of my favorite movies Hot Fuzz I saw the premiere with someone I dated who I haven’t heard from in years and it just so happens that it’s one of my closest friend’s favorite movie as well. Game of Thrones will forever be linked to this group of friends I have now even though the future of that group watching it together may not be certain. With books this concept bears much more weight, being an avid reader. There are books and authors forever linked to people who I’ve either had long discussions about, read with at the same time, or either recommended or had recommended to me. One friend is linked just to the process of buying the books. I would pick her up from her house, drive to the nearest Barnes & Noble, buy a ridiculous amount of books, then go grab something for dinner. That experience will be linked to certain books every time I look at them. There are people in my past who I no longer speak to or think fondly of but will be reminded of them in a positive way by the impressions they had on my taste. I guess this is why I sometimes see on a musician’s or author’s webpage comment section you’ll see comments like “Your creative-thing-you-made got me through a hard time in my life” even when that said creative-thing-they-made is not linked to whatever problem they had whatsoever. It’s just a thought. Living in Books More Than Anywhere Else – Neil Gaiman’s The Ocean at the End of the Lane. On Wednesday, June 19th, 2013 I received my copy of Neil Gaiman’s new book, The Ocean at the End of the Lane at Symphony Space in New York, right after hearing Erin Morgenstern (author of The Night Circus, which I have never read but may pick up in the future) do a little interview with the author himself, followed by two readings from the novel and a little Q&A. I met the author, as in, I approached the author afterward to sign my copy of the new book, sign my copy of American Gods, and thank him for all the writing advice he gives on his blog, to which he responded something very humble along the lines of least I could do, just doing my part to help, I like to help anyway I can. I was honestly so tired and my feet and back were so ache filled that I can’t remember exactly what he said. Immediately on the train ride home I began reading the novel, and then proceeded to finish it over the next two mornings. The Ocean at the End of the Lane is definitely a Neil Gaiman novel, and by that I mean it is a great novel. Every time I read a Neil Gaiman novel I think to myself This is THE Neil Gaiman novel. Really everyone of his novels is THE Neil Gaiman novel and so is this one. If you don’t like Neil Gaiman novels I am not sure this one will convince you otherwise. I’ll try to avoid spoilers but be warned I want to talk about this book so I may not try very hard. When I think of writing about this novel it’s not actually about the novel itself, but what it makes me remember about childhood. 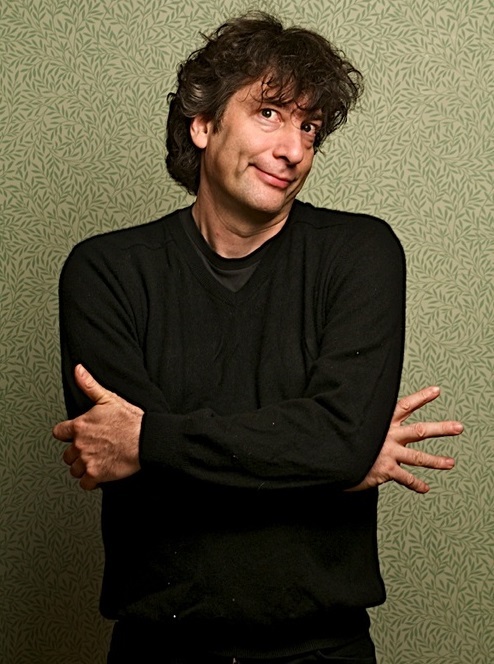 On stage at Symphony Space Neil Gaiman referred to the “indignities of being a child” and “being able to enjoy the small things” and that is this novel evoke, memories of childhood. I remember telling a teacher I was being picked on in 1st grade to the response of having to “deal with it”, when my father used to take me to McDonalds after religion class for the Halloween toys they had in their Happy Meals, of my sister telling me that voting in the Kids Presidential Election by calling into Nickelodeon didn’t actually help elect the President of the United States, of how delicious it was when I’d eat two slice of pizza with Garlic Salt on it while my family ate Chinese food because all I would eat as a kid was Pizza and Steak for dinner. It shouldn’t be a surprise that the book evokes memory, as it is about memory. The unnamed narrator is retelling a story of his childhood, filled with books, making new friends, fears of getting in trouble, delicious food, magic, monsters, and whimsy that only Neil Gaiman wizard-like use of language can summon. This is definitely an adult novel, but not necessarily only for adults. It’s themes definitely carries with it something a child would not understand, nor would a teenager maybe fully appreciate it. I shouldn’t say that, what I mean is, as a teenager I probably wouldn’t appreciate it. You know how it is, petty problems, thinking you’re invincible. I don’t think teenage me would quite know what to do with this book. A fear I had as a kid that Neil Gaiman writes so well is the fear of getting into trouble, of not being believed because you were a kid, of being told you’re lying when you’re telling the truth. When I was young I was good as much as I possibly could because I always thought I would be yelled at. Something about yelling as a kid filled me with fright and I don’t even think I was yelled at that much. What I would see is my sister being yelled, being the rebellious teenager she was, by my mother and thinking there is no way I ever want that to happen to me. I used to defend my sister on car rides with my parents in hope that she would get yelled at less as well, thinking it had to be the worst thing that could happen to you. When teachers yelled at me, I became a mess, thinking oh no, they’re going to tell my parents which will lead to more yelling. There’s nothing more stressful for a kid then when you tell the truth and no one will listen, and the narrator of The Ocean… goes through that as well as I did. I remember my cousin cursing when he was three years old, which at five I was always taught was very bad to do so of course I told my parents. He immediately said that I was in fact the one cursing and that I was just trying to get him in trouble before he could get me in trouble. I could still see the look on my mom and aunt’s eyes deciding on who to believe even though I was the one telling the truth. Like me, but not like me, the narrator tries to tell his parents the truth about what is happening around him only to find himself in deeper and more dire trouble as the novel progresses. and like myths, all the magic in the book doesn’t need to be explained, it just is and it works perfectly. You just accept it for what it is, you become convinced that there is indeed an ocean at the end of the lane where the narrator lived growing up. Enjoying the small things in the book isn’t just about food, it’s about a certain part of your bedroom made just for you, that small crack of light in your open door that let you read past your bedtime, that secret way through your backyard that you think only you are aware of, but also it’s about food. Now, this is coming from a guy who has no complaints about George R.R. Martin’s description of food in his A Song of Ice and Fire series but the food in The Ocean… is quite different from a kids perspective. There’s such a joy with every little thing the narrator eats that you sometimes forget as an adult. You’re not thinking about calories, fat content, or worry you’re eating too much or too little. It’s just a matter of being hungry, and then enjoying the food you’re given whether it’s good or not. On the April 22nd edition of The Indoor Kids podcast with Kumail Nanjiani and Emily Gordon they discuss Bioshock Infinite. One of their guest Film Crit Hulk on the discussion of spoilers planted in my brain this radical idea that he’s been doing. The idea is that he doesn’t watch or read previews for television, movies, or video games. I tried this with Edgar Wright, Nick Frost, and Simon Pegg’s new film The World’s End trailer only to give in within hours of it being posted online. Similarly when I saw on Reddit that the trailer was going to be posted for The Hobbit: The Desolation of Smaug on the following Tuesday I am pretty sure a noise came out of my mouth that registered a lot of happiness. This was for a trailer, not the movie itself. That’s kind of sad, though honestly if it was the movie itself I probably would of made the same squee sound. After hearing this random guy talk about avoiding trailers and how it changed his excitement and reevaluated the idea of watching trailers at all. It’s somehow easier for books because there’s no real videos and I am not a fan of reading online. I know there’s preview chapters of Neil Gaiman’s new book, The Ocean at the End of the Lane and that George R.R. Martin has posted preview chapters for The Winds of Winter but they’re easier to avoid. Some previews are unavoidable with the websites I visit. Just for an example, there is a new Super Smash Bros. in development for Wii U. I don’t own a Wii U yet because there hasn’t been any software that’s really caught my eye. It’ll be impossible for me to visit Tumblr, IGN, or Twitter without hearing of a character included in the game but I can avoid any video previewing what they’re like. I’ll apply this to other websites as wlel. Some of the subreddits I am subscribe to will have to be unsubscribed to I am sure. Unrelated but sort of related is something I realized about this year in movies. This year has been the least amount of times I’ve been to the movies than any year I can remember. So far this year I’ve seen the horror movie Mama and Star Trek Into Darkness. I think that’s about it. I didn’t see Iron Man 3 or The Great Gatsby and I probably won’t see Man of Steel. The only movies I know I will 100% go see is The World’s End and The Hobbit: Desolation of Smaug. I definitely have interest in Pacific Rim, Elysium, Anchorman 2, Thor: The Dark World, Ender’s Game, Oldboy, and Sin City: A Dame to Kill For but I was interested in those other three film I didn’t go see and I don’t know if I will be compelled to see these in the theater either. If you read my last post about 2012’s The Hobbit: An Unexpected Journey then you know the jist of what this one was about. Also, I suggest reading my posts about adapting books to movies for my views on that sort of thing. Let’s get right to it. Parts of the book I was glad wasn’t in the film. The bits of children’s magic – I can honestly say I didn’t miss the mentioning of the Old Took’s magic studs that never came undone and fastened themselves. Nor did I miss William’s mischievous purse that Bilbo tries to steal, alerting the trolls to Bilbo’s presence when the hobbit tries to prove himself as a burglar. The bit with the hoods – In the book, everyone of the dwarves has their own uniquely colored hood that distinguishes them from each other with eventually loaning Bilbo one that is too big for him. Instead of using brightly colored hoods to make them look different the movies give them different personalities, clothing, speech, appearance and ways of fighting. Parts of the book I was surprised to find in the film. Good morning! – The banter between Gandalf and Bilbo in the beginning just screams “I don’t advance the plot! Cut me!” so I was highly surprised it wasn’t cut. The Songs – Although changed a little bit, I was highly surprised to find any of Tolkien’s songs in the movie at all. Of course Blunt the Knives is on my top 100 songs played on my iTunes now. I’m wondering if there will be any songs in the next two films, who knows? This turned out a lot shorter than I thought it would, so I’ll post it shortly after Part I. Last year’s adaptation of J.R.R. Tolkien’s The Hobbit was met with mixed reviews ranging from people who were either expecting the book, or people who were expecting The Lord of the Rings films. I, on the other hand, loved it. I saw it three times in the theater and about eight times repeatedly on blu-ray. The movie is a strange case for movie adaptations because it takes a lot of liberties with the story of the book, but it manages to keep in little aspects of the book that you’d think would be cut day one for a movie script. What else it manages to do is keep to key themes Tolkien often included in his books. Let’s get the negative out of the way first. Three changes from the books I disliked. Grocer vs. Burglar – I want to note the distinction really quickly that I used “dislike” instead of “hate”, two very different meanings. In the film when the line “He looks more like a grocer than a burglar” is delivered by Thorin, everyone has a nice laugh and Bilbo looks at Thorin and then to Gandalf in confusion, as he has yet to be informed he’s to be hired for burglarious activities. The entire dinner scene after Thorin’s arrival has Bilbo basically trying to get out of whatever adventure Gandalf is planning. Azog’s Hand – I honestly don’t mind Azog the Defiler not being killed off and his son taking his place. This might confuse moviegoers who didn’t see the difference between Saruman’s orcs and Sauron’s orcs with how they created, given the scene with the Uruk-hai basically being born from mud and slime of the ground, the question of how orcs reproduce would come into question. The scene I bring into question is the flashback to the Battle of Moria, in which Thorin Oakenshield earns his nickname. It’s all fine and good until Thorin cuts off Azog’s hand. I get what they’re trying to do, link the evil of Azog to the evil of Sauron, raising the unexpected villain up to the level of the Dark Lord and foreboding the darkness settling in on Middle-Earth. The problem is, it seems rehashed more than repeating thematic and not only does it not raise up Azog as a villain, but lessens the scene in the Fellowship prologue with Isildur and Sauron, putting Sauron on the same level as an orc. Bilbo’s Sword – This one stems from my study of Corey Olsen, The Tolkien Professor’s criticism of The Hobbit but has been so ingrained into my understanding of the book now that I can’t shy away from it. In the book, Bilbo’s discover the knife he would later call Sting on his own in the Troll’s cave along with Gandalf taking Glamdring and Thorin taking Orcrist while in the film Gandalf discovers Sting on his own, handing it to Bilbo with a bit of exposition and how it’ll glow blue. Gandalf’s explanation takes away from the development of Bilbo later on in what Corey Olsen and I believe is the turning point for Bilbo. But in slapping all his pockets and feeling all round himself for matches his hand came on the hilt of his little sword – the little dagger that he got from the trolls, and that he had quite forgotten; nor fortunately had the goblins noticed it; as he wore it inside his breeches. Now he drew it out. It shone pale and dim before his eyes. “So it is an elvish blade, too,” he thought; “and goblins are not very near, and yet not far enough.” But somehow he was comforted. It was rather splendid to be wearing a blade made in Gondolin for the goblin-wars of which so many songs had sung; and also he had noticed that such weapons made a great impression on goblins that came upon them suddenly. The scene in the film yet again establishes Bilbo as a humble hobbit and not an adventurer or someone who intends to use a sword, setting up the scene in which he shows Gollum mercy, but it takes this turning point away from Bilbo in the film. It’s after he realizes his sword is the stuff of legends that he decides there’s no going back. It’s an important moment for him, on his own, without Gandalf or the dwarves to help him when he encounters Gollum. Sting is just as important to Bilbo’s development as is the One Ring and the film sort of fails to establish this. Additions to the film I enjoyed. Radagast the Brown – Even though he does a terrible job of drawing off the Wargs and Orcs the addition of Radagast the Brown imbeds An Unexpected Journey with a theme very familiar to Tolkien’s work that the Lord of the Rings film trilogy failed to realize at times. The theme of nature and the natural world being affected by the dark power infected Dol Guldur as well as the theme Gandalf mentions to Galadriel later in the film. His addition also brings a lighter tone to the film that I believe is refreshing. Dol Guldur, The Necromancer, The Witch-king of Angmar and the Morgul Blade – While everyone was complaining that they turned the Hobbit into three films, I got excited because this meant everything only mentioned in the appendix of The Lord of the Rings would come to fruition in these movies. In the book Gandalf just disappears for a bit, says he took care of the Necromancer and wanders back into story. Now in these films we have Sauron in his Necromancer body bringing back the Nazgul, including the Witch-king of Angmar who I believe was underused in the Lord of the Rings trilogy and Gandalf and the White Council basically on their own side-quest that will have grave repercussions for The Lord of the Rings. I really hope we get to see the Necromancer in the two films, as we know Benedict Cumberbatch did some acting for it. Everything changed about the dwarves (so far)- Until the very end of the Hobbit, after Smaug has been taken down the dwarves are kind of goofy, falling over each other, getting captured by trolls, orcs, and elves. None of them are very distinctive at all except with a line or two here and there until later on when Thorin becomes infected with dragon-sickness. In the films, they’re much more unique with drastically different physical appearances, personalities, speech patterns and motivations though sometimes subtle. In the film you can see Balin and Bofur taking a liking to Bilbo, and how Fili and Kili are young warriors trying to prove themselves to their Uncle Thorin, with a bit of youthful mischief still in them. You can see Ori as the baby of the group, a bit more naive than the rest of them and Balin is the eldest, wise grandpa dwarf, friendly but a bit cynical and cantankerous. Then there is Thorin Oakenshield, the tragic king of the likes of Hamlet or Macbeth as compared to Aragorn’s King Arthur. Thorin is kingly but filled with anger and mistrust, unable to discern friend from foe, easily holding grudges against those who have wronged him. His progression from dismissing Bilbo to embracing him was great for this story and I am even more excited to see his development in the next two movies. Keep reading for Part 2 in which I discuss what I am glad they left out from the books and what I was surprised to find they put in. We can’t stop here, this is spoiler country! – Spoiler Paranoia: When is it warranted, and when isn’t it? Ah, a short reprieve from Thesis to do some writing. I’ve been working on Thesis since May 10th and the time it takes up has made me antsy to write so badly. Since yesterday was a monumental episode for HBO’s Game of Thrones I thought it would be the perfect time to discuss spoilers. In case you don’t know what spoilers are they’re facts about any medium that has a story or plot revealed to you before you can find out for yourself. It seems to me lately that spoilers, the term not spoilers themselves, has entered mainstream pop culture over the last couple of years. I think this is akin to the pop culture phenomenon of both Harry Potter and Lost. That’s just what is on the forefront of my mind as far as spoilers in mainstream media. I distinctly remember when Harry Potter and the Half-Blood Prince came out the controversy of an important plot point, which I will not post here, being scanned onto the internet and displayed. The series was a big enough hit that the controversy had made it into the news. Then there was ABC’s Lost which had a strong structure around the mystery of the island. Thinking about it now, I wonder if that coincided with the rise of DVR and Tivo because if you spoiled Lost for anyone before they were able to see it, you were in trouble. But why are spoilers such a big deal? The big deal is that you are robbing people of an emotional connection to a story they may only get to experience once. Not everyone has time to rewatch, reread and replay. Not everyone wants to figure out what’s going to happen before it happens. People with intense careers, families and limited money only get to experience a story once and then have to move on. There’s only so much time in a day. So when a plot element is revealed to them before they’re given the chance to experience it for themselves the journey may seem like a waste of time. No one wants their time wasted. Sometimes it’s better to not know. In my life I have never peaked at a Christmas or Birthday present because I wanted to be surprised. I only get to unwrap that specific present on that specific day once. Once you know how a story ends, who dies, who lives, who sleeps together and who gets married you never not know. So to that extent I understand why people would want to shield themselves from spoilers. There are some spoilers that are just ingrained into pop culture now and there’s no way around them. If you’re complaining about someone spoiling something that came out anymore before the turn of the century you are asking for too much. As a kid the only Star Wars film I had ever seen was the first one but I knew that Darth Vader was Luke Skywalker’s father. It had been beaten over my head for years but when I finally borrowed a set of the three movies from a friend on VHS when I was twelve and watched Empire Strikes Back I was still blown away by the movie even though I knew what happened. That’s just me though. I’m a rereader, rewatcher, replayed. The replay value of stories is important to me. I am not a fan of throwaway entertainment and if a spoiler is enough to ruin the story for me I am probably not going to waste my time with it. I see both sides of it though. For example, last night t-shirt brand RIPT apparel immediately on their twitter account spoiled last night’s episode of Game of Thrones. This is a company that probably sells Game of Thrones t-shirts and should know their market doesn’t take too kindly to spoilers like that. If you haven’t seen last night’s episode do not search out their twitter account. An editor of a website I frequent who called them out on the spoiler proceeded to get into an argument with another twitter user on whether or not it was a big deal because the book has been out for so many number of years and the information is out there no matter what. This is an example of someone being insensitive to another person’s experience of a story. On the flipside recently Matt Smith announced he’d be leaving Doctor Who during the Christmas special this year. This was literally a press release and people were complaining of spoilers. Similarly a couple months ago when comedian and host of The Talking Dead Chris Hardwick hosted a panel for The Walking Dead an audience member who voluntarily attended the show complained about spoilers in heckling manner when they began talking about episodes from the current season. This is when Spoiler Paranoia crosses the line into ridiculous. For me though, spoilers aren’t a grey area. When I first read A Game of Thrones, A Clash of Kings, and A Sword of Storms I was glad none of it was spoiled for me because they had an emotional impact on me. On the other hand, remember that spoiler about Harry Potter and the Half-Blood Prince? I know what it is, and wasn’t a reader of those books at the time. I only began reading them last summer and have just gotten up to the sixth book. I know what happens because I’ve seen the movies with friends and because of that spoiler but it won’t ruin those books for me because they’re fun. I guess my point is that spoilers are on a case by case basis for me but do everyone a favor and don’t spoil anything for anyone. I’ve been guilty of this because I get excited about stories, and I want to talk about them to the point that sometimes I don’t think before I speak but don’t ruin the experience for other people. At least try not to.